This national real estate data layer has all the details you need to allow consumers to understand their school choices and how they compare. Providing School Data for parents looking to purchase a home is one of the most critical resources a broker or agent can provide. Research shows that home buyers list the quality of schools and their proximity as key factors in their decision to purchase a home. Become the local authority for school data! Home Junction has a full menu of hyper-local school databases that brokers and agents can easily embed into their website. This school data answers many of the questions a family will ask about neighborhood schools and where their children will be educated. All a broker or agent needs to do is add the HOME JUNCTION SCHOOL DATA API to their website. That API will then feed the relevant school databases for that county, city, zip code or even drill down to a local neighborhood or subdivision. 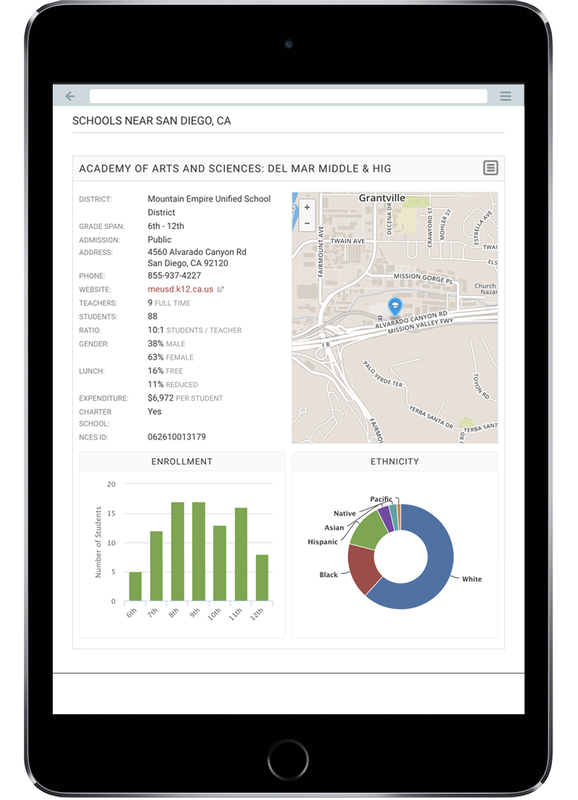 In addition, Home Junction provides a GEO-SPATIAL feature which will display important school data on a map. That map will be integrated with the local MLS database to show the proximity of schools in relation to a property being viewed. Parents want this school information. They continually update this information, and will want to conduct business with the real estate firm that has access to reliable and accurate public school statistics. Here’s another important consideration. School data and attendance zones are always changing. Home Junction’s proprietary data aggregation systems will so brokers and agents can be sure they have current school data. Providing this type of school data also has tremendous advantages as far as email and social media marketing on Facebook, Instagram, Twitter and Pinterest. Adding a school database to your website also has positive implications for search engine rankings. Consumers will search for school data. Providing school information can help increase rankings and time spent on your website – critical factors used to determine rankings by Google and Bing. Adding a school database to your website also has positive implications & advantages for search engine rankings, email and social media marketing on Facebook, Instagram, Twitter and Pinterest. For more information about how easy it can be to add this valuable school resource to your website, call 858-777-9533 or contact a Home Junction representative here. Adding a school database to your website also has positive implications for search engine rankings.